Wheels celebrates the joy of driving with 2016 COTY winner. The proving-ground tests have been made, the thousands of kilometres have been driven, judgments have been argued and a verdict reached. 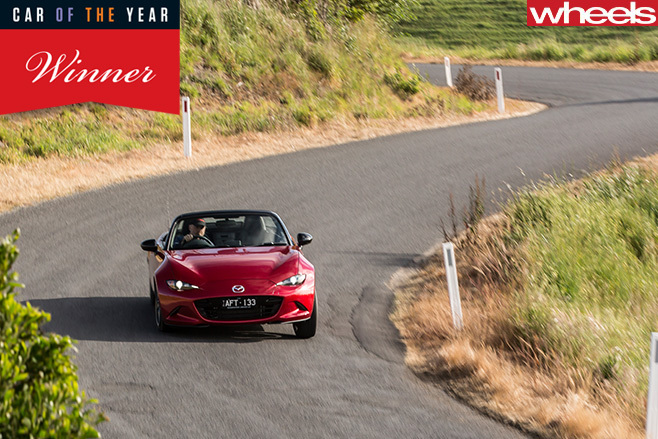 The 2016 Wheels Car of the Year is the Mazda MX-5. It is the third win for the popular sports car, with previous generations having won the prestigious award in 1989 and 2005. 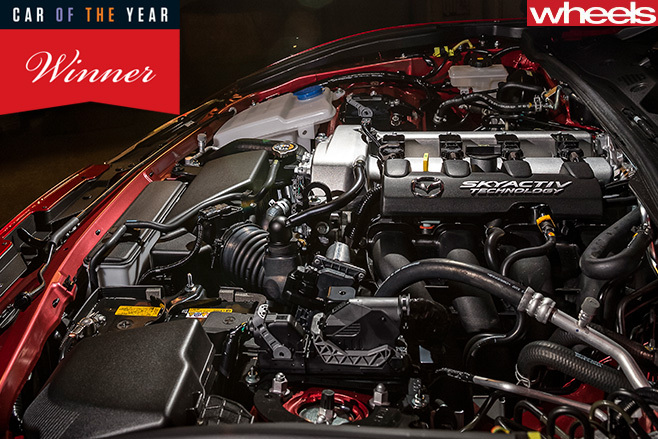 The 2016 Car of the Year was announced at a gala event in Melbourne tonight. “The Mazda MX-5 is motoring at its purest,” Wheels Editor Glenn Butler said. “It proves that you don’t need brute power and insane speeds to have a momentous time behind the wheel. 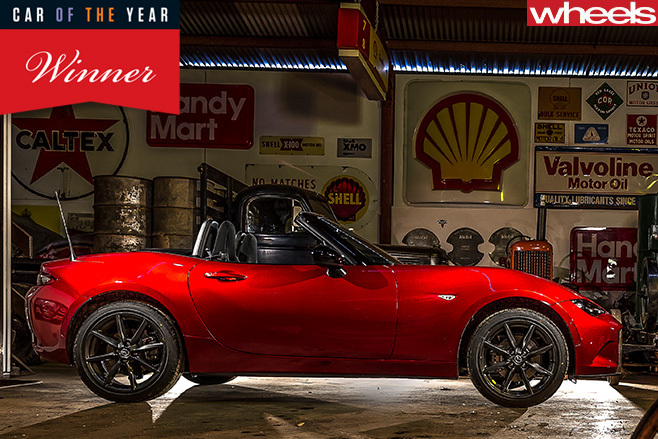 “The MX-5 roadster is a stunning achievement. It’s smaller on the outside but more practical on the inside, it’s lighter than its predecessors but is also stronger, and it is quite simply better than ever. “But, more than ticking boxes and meeting our tough testing criteria – which it did impressively – this is about the joy of driving a great car. 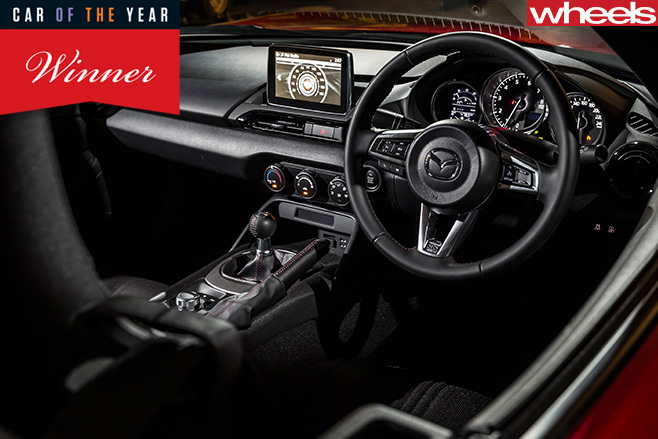 Get the Wheels February 2016 Car of the Year issue now, also available in digital edition. The diminutive Mazda roadster won the most coveted award in Australian motoring from a field of 25 cars, all of which faced a ruthless winnowing over three days at the Holden proving ground at Lang Lang, outside Melbourne. That cut the contenders to a shortlist of eight, which were evaluated over a further four days on public roads. The other seven shortlisted cars were the Audi Q7, BMW i8, Jaguar XE, Mazda CX-3, Mercedes-AMG GT S, Volkswagen Passat and Volvo XC90. But the judges concluded that the emotionally appealing and resource-efficient Mazda roadster had done enough for victory. Panel members also found themselves charmed by the way Mazda had expressed coherently its design team’s philosophy of eschewing excess and maximising satisfaction. “[The MX-5] gets under your skin and attaches itself directly to your emotional centre, in the most exquisite fashion imaginable,” Road Test Editor Nathan Ponchard wrote in Wheels’ Car of the Year issue, on sale digitally now and available in newsagents tomorrow (January 21). “It’s motoring at its purest – beautifully simple, yet simply beautiful to drive – and it achieves all that with a delicate global footprint.